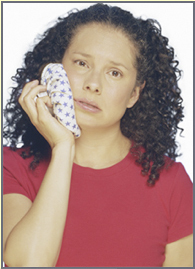 It can happen to anyone: the sudden onset of a throbbing toothache at the most inconvenient of times. Perhaps it arrives in the middle of the night, or worse, at the start of your weekend–when a whole lot of time and agony seem to stand between you and the next available dentist appointment. You’ll live, of course, but there is no need to suffer so badly! With a little observation and resourcefulness, the wait for professional care can be a lot less excruciating. You won’t know for sure what’s truly to blame until you see your dentist, but a quick assessment of your symptoms and the location of your discomfort may prove telling. For instance, extremely sharp, shooting pain and fever suggest an abscessed tooth is likely, whereas tenderness in the jaw area and a clicking sound is usually due to TMD. Rinsing your mouth with water and salt, and stepping up your normal dental routine in general can also keep the problem from getting worse. Once your appointment is under way, use the time you have with your dentist to its fullest. He or she will be able to determine the cause and treat the toothache accordingly. After the problem has been treated, be sure to ask for a detailed explanation and recommendations to help you avoid a similar experience in the future. Brushing, flossing and regular check-ups continue to play central roles in the world of preventative care, but based on your unique dental situation, additional procedures may be recommended as part of your treatment plan.